Preise inkl. | exkl. | exkl. & inkl. MwSt. 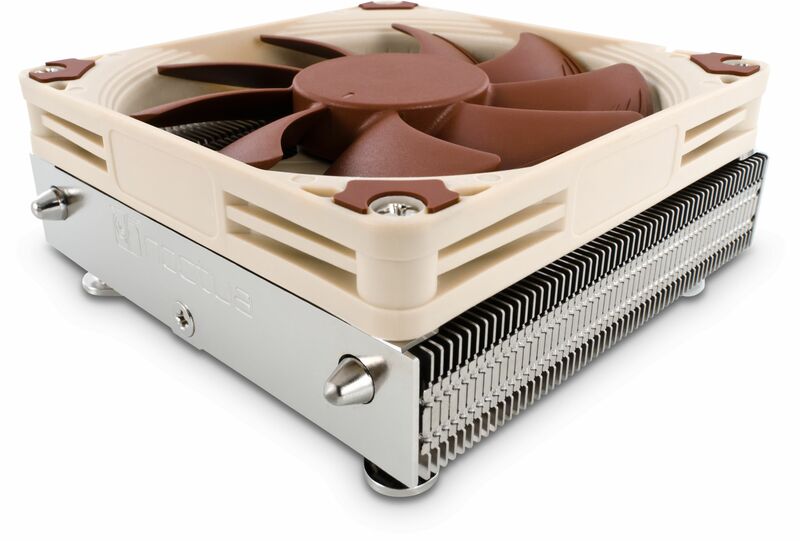 Introducing Noctua's smallest cooler to date. The NH-L9i stands just 37mm tall and is designed only for Intel CPUs that output a maximum of 65 watts TDP. The NH-L9i is a premium quality quiet CPU cooler for Intel LGA115x based HTPCs and Small Form Factor systems. At a super-low profile of only 37mm, the NH-L9i is ideal for extremely slim cases and due to its 95x95mm footprint, it provides full compatibility with tall RAM modules and VGA cards on mini-ITX mainboards. The custom designed SecuFirm2 mounting system for LGA115x makes installation child's play and thanks to the highly optimised NF-A9x14 premium fan that supports fully automatic speed control via PWM, the NH-L9i runs remarkably quiet. 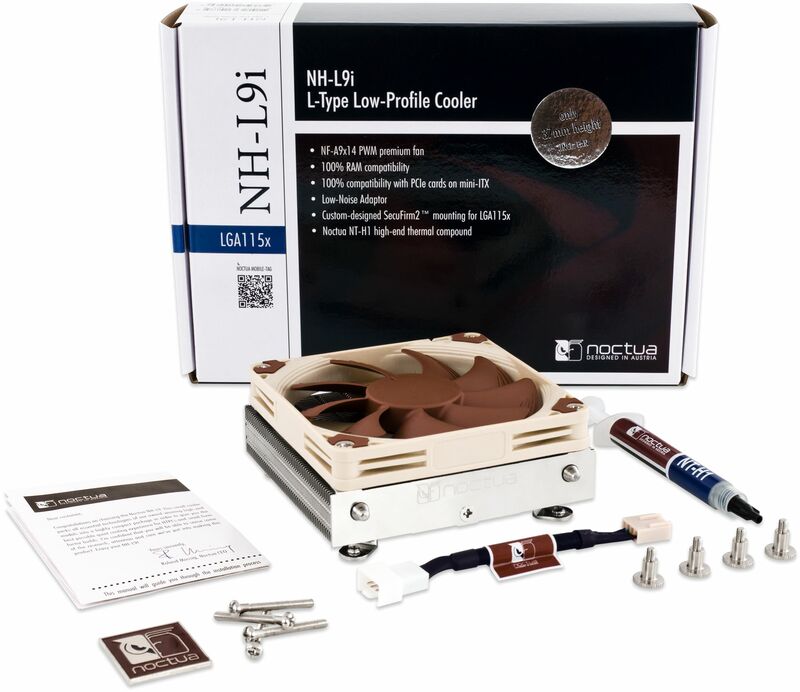 Topped off with Noctua's renowned NT-H1 thermal compound, the NH-L9i fuses everything users have come to expect from Noctua's larger coolers into a super-compact package for slim HTPC systems. Due to the slim 23mm heatsink and the NF-A9x14 low profile fan that measures only 14mm in thickness, the NH-L9 stands a mere 37mm tall, which makes it ideal for use in compact HTPCs or Small Form Factor cases that offer minimum clearance for CPU coolers. The NH-L9i has a 95x95mm footprint that complies exactly with the Intel LGA115x socket keep-out zone. This means that it won't cause issues with chipset coolers and doesn't overhang the RAM slots, so it is fully compatible with tall memory modules. Most Intel LGA115x based mini-ITX mainboards have the PCIe slot sitting right next to the 95x95mm socket zone. While larger coolers that exceed this zone are likely to block the PCIe slot, the 95x95xmm sized NH-L9i provides full compatibility with PCIe cards. The highly optimised NF-A9x14 premium fan features Noctua's proprietary AAO frame as well as sophisticated aerodynamic design measures. Supporting PWM for fully automatic speed control, the NF-A9x14 allows the NH-L9i to stay remarkably quiet. Allowing a reduction of the maximum speed of the NF-A9x14 fan from 2500 to 1800rpm, the included Low-Noise Adaptor (L.N.A.) makes it possible to achieve near-silent setups using CPUs with less than 65W TDP. The NH-L9i bundles a custom-designed, backplate-less SecuFirm2 mounting system for LGA115x that offers extended compatibility with mini-ITX boards and makes installation easier than ever, all while maintaining the trusted SecuFirm2 quality. Noctua's much-acclaimed NT-H1 is a well proven pro-grade TIM solution that provides minimum thermal resistance, excellent ease-of-use and outstanding reliability. Noctua products are renowned for their impeccable quality and outstanding longevity. Like all Noctua fans, the supplied NF-A9x14 features an MTBF rating of more than 150.000 hours and the entire NH-L9i package comes with a full 6 year manufacturer's warranty. Caution: The NH-L9i is a highly-compact low-profile quiet cooler designed for use in small form factor cases and HTPC environments. While it provides first rate performance in its class, it is not suitable for overclocking and should be used with care on CPUs with more than 65W TDP (Thermal Design Power). Please consult the TDP guideline to find out whether the NH-L9i is recommended for your CPU. Used this to replace a standard, noisy Intel branded fan. Very high quality manufacturing and finish. At least as effective as the fan that was removed (cooling an Intel Core i3-2100S @ 3.10 GHz - the low power model). Clear documentation. The only downside is the small case fan is now audible (but not above the ambient noise in my room).